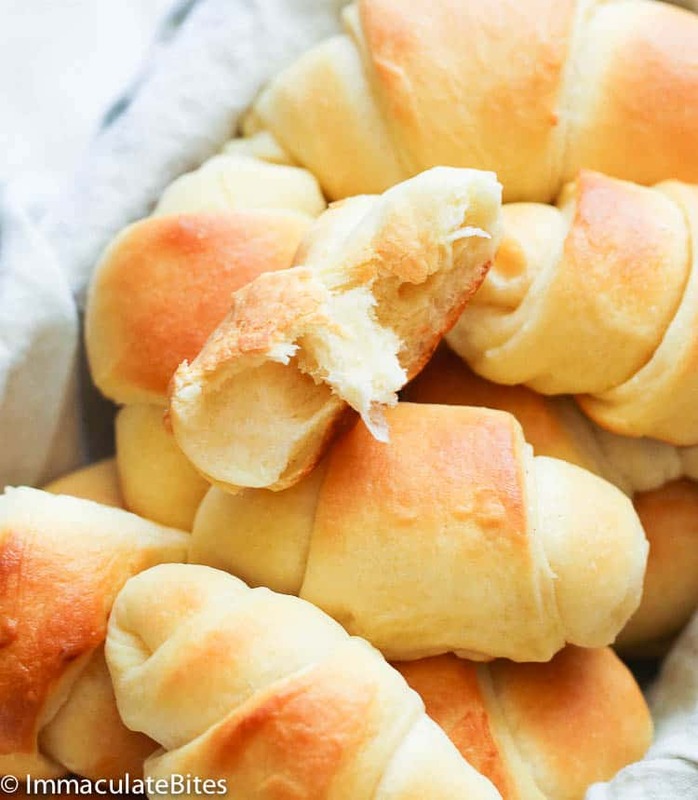 Homemade Crescent Rolls – sweet and soft with a slight crust on the top and bottom, and fluffy buttery on the inside. A great make-ahead dinner rolls for your holiday meal! It was around post Christmas last year when I tried my hands on these sweet, soft and buttery homemade crescent rolls. Honestly, I wasn’t that confident to make these as I thought I might be having issues with the dough (yeah, I still do get that fear from time to time 😉 ). But the bread lover in me screams for an adventure! And what could be better after Christmas eve than that sweet buttery smell off of the oven? Boy, I was thankful that I trusted that inner voice in me. Turns out that these beauties here are easier to make than I think it is and waaaay better than the tubed store-bought ones. Are crescent rolls and croissants the same thing? Believe it or not, there are still some who interchangeably use crescent and croissants. Guess it’s because these two have the same shape, but it all ends there. 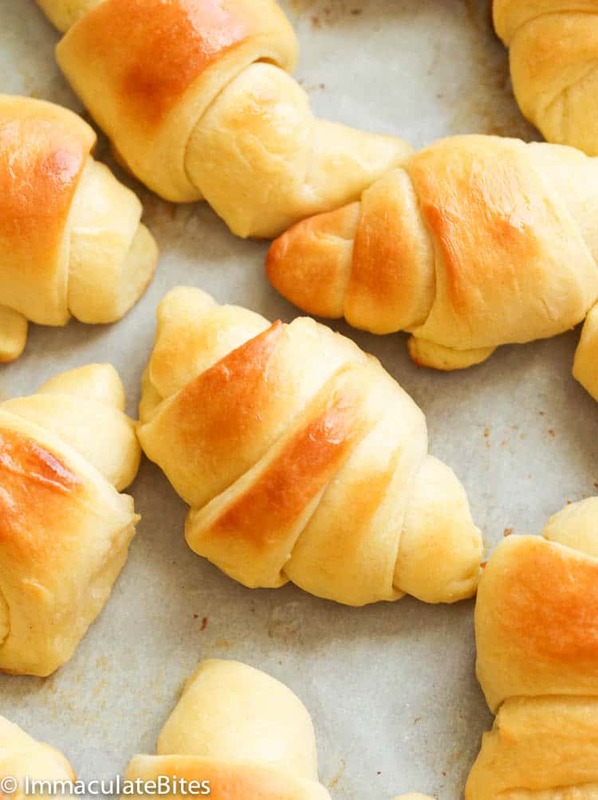 Croissant rolls are flakier, richer and tastier than crescent rolls. It has lots of butter and folded into several times to create that layered, thin, flaky texture. On the other hand, crescent rolls are pretty much easier to make than croissants with less baking time, of course. It’s buttery and slightly crisp on the outside yet fluffy and soft on the inside. And oh, they are mostly serve as dinner rolls, whereas, croissants are more like of a breakfast staple. How to roll crescent rolls? 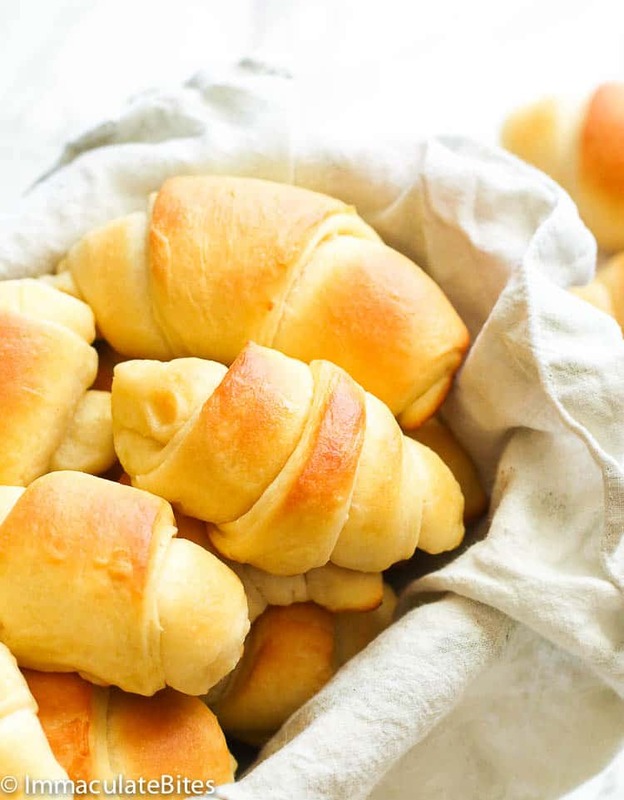 These crescent rolls are easy to make than you think it is. 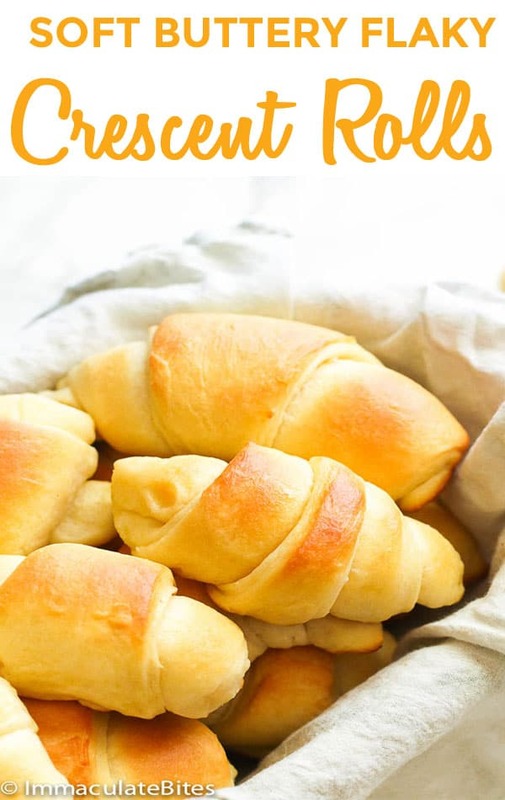 Don’t be fooled by that fancy roll shape ’cause I’m about to show you how even a newbie can make these rolls and roll the dough like a crescent roll pro! After the dough has risen (about 1 1/2-2 hours), you punch it down and transfer to a lightly floured surface. Then divide the dough in half (you may freeze it this time). You’ll have to roll the dough into a 12-inch round and flattened dough, from there you divide it into four and cut them up into wedges. Lastly, roll up the wedges starting from the wide end up to the tip until you form it into crescent shapes. That’s just about it. Easy, right? Name it! It can be perfectly stuffed with almost anything. Make sure that the oven is already preheated and the fillings are ready to go before cutting the dough into wedges. You simply have to spread the filling across the wide bottom part of the triangle, then roll it up until the narrow tip wraps the roll all around. For an extra flavor, you can choose either to brush the unbaked rolls with melted butter plus dried herbs, shredded cheese, cinnamon sugar or coarse sugar. I guarantee you that these crescent rolls will be long gone before it even reaches back to you when passed around during the holiday meal. Soft, buttery, sweet with a little crisp on the outside – what’s not to love? To make ahead, you can prepare the dough as directed until in step number 6. Just place them in a lightly oiled ziploc bag and put it in the fridge for up to 2 days. Then resume with step number 6. Or you can freeze the crescent-rolled dough in a single layer in a baking sheet overnight with a plastic wrap. 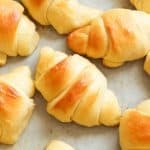 Homemade Crescent Rolls - sweet and soft with a slight crust on the top and bottom and fluffy and buttery on the inside. A great make-ahead dinner rolls for your holiday meal! Start by combining water and yeast in the stand mixer bowl, using a dough hook. Use a large bowl , if making this by hand . Let it sit until dissolve for about 5 minutes. Meanwhile in a microwave safe medium bowl, combine milk, with the butter pieces,sugar, salt and microwave for about a minute. Stir until everything is melted. Pour butter mixture into the large bowl or stand mixer. Thoroughly mix – mixture should be lukewarm. If not, let it sit for a few minutes. Whisk in eggs. Gradually add about 3 3/4 cups of flour and continue mixing dough on low speed adding just enough flour to form soft dough. If mixing by hand remove dough and place on a lightly floured surface . Knead for about 6-8 minutes. Place dough in a greased bowl, turning once to coat the dough. Cover loosely with a clean cloth and let rise in a warm place for 1 1/2 to 2 hours or until doubled..Punch the dough down. Working on a lightly floured surface, divide dough in half. Then roll out l into 12-inch rounds; cut into 16 wedges. Roll up wedges, starting from the wide end, to form a crescent shape. Spray baking sheet pan with oil or butter , then place crescent rolls on oiled pan about ½ – 1” apart. Cover lightly with kitchen towel and let rise for about 30 minutes or until dough is puffy. Preheat oven to 400 degrees F. Brush tops with butter. Place into oven and bake until golden brown, about 12-14 minutes. Serve warm with remaining butter, if desired. Start by combining water and yeast in the stand mixer bowl, using a dough hook. Use a large bowl , if making this by hand. Let it sit until dissolve for about 5 minutes. Meanwhile, in a microwave safe medium bowl, combine milk, with the butter pieces, sugar, salt and microwave for about a minute. Stir until everything is melted. Pour butter mixture into the large bowl or stand mixer. Thoroughly mix – mixture should be lukewarm. If not, let it sit for a few minutes. Whisk in eggs. Gradually add about 3 3/4 cups of flour and continue mixing dough on low speed, adding just enough flour to form soft dough. If mixing by hand remove dough and place on a lightly floured surface. Knead for about 6-8 minutes. Place dough in a greased bowl, turning once to coat the dough. Cover loosely with a clean cloth and let rise in a warm place for 1 1/2 to 2 hours or until doubled. Punch the dough down. Working on a lightly floured surface, divide dough in half. Then roll out l into 12-inch rounds; cut into 12-16 wedges. Can I make the dough ahead of time? Yes you can, made the dough and shape . let it rest in fridge over night ; bake in the morning. Can baking powder or active dry yeast be used instead? If so, how many tablespoons? Active dry yeast would work for this recipe -same amount. I made rolls as directed and loved them. I do have a suggestion – add 2 tsp of the sugar to step 1 – really helps to proof yeast. Yeast blooms best with some sugar. Definitely going to try this weekend. Please do let me know how it turns out for you. Happy baking! Can these be made without the sugar? Thanks. I haven’t tried making these without sugar, so I can’t tell you exactly how it’ll turn out. But I’ve read somewhere online, that they substituted sugar with applesauce or the likes.